7-Eleven Birthday Freebies (7/12-7/19) ~ Big Gulp, M&M’s , Cookies & More! Want to load up on freebies from 7-Eleven? 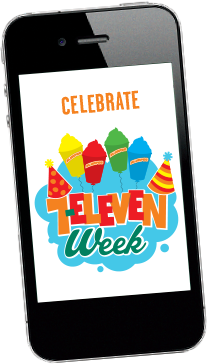 Be sure you have the 7-Eleven App downloaded on your smartphone and take advantage of all the Birthday Week Freebies 7/12-7/19. Grab the App HERE or you can text “FREE” to 711711 to get the daily updates for 7-Eleven Week. Previous post7-Eleven FREE Slurpee Day 7/11! Next postMark Your Calendar ~ Texas Motor Speedway Ultimate Drive In Movie Featuring the Little Rascals (8/16/14)!